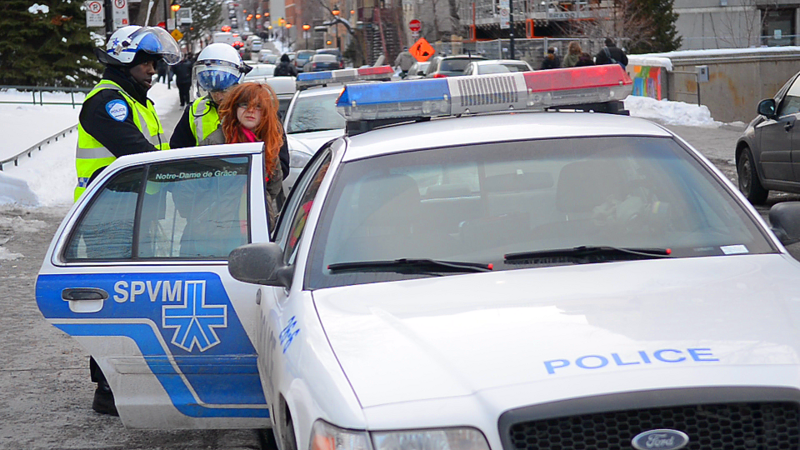 A commemorative demonstration against the tuition indexation fell flat early Friday night when Montreal Police quickly shut it down. Students gathered at Place Émilie-Gamelin for the one-year anniversary of the March 22, 2012 protest. Last year over 200,000 students exercised their democratic right to free assembly and flooded Montreal’s streets to protest a tuition fee increase of $1,625 over a five-year period by then-Premier Jean Charest. Police have taken a heavy handed approach to student protesters and the Service de police de la Ville de Montréal seemed intent on shutting down the public assembly early Friday when it marked the third consecutive protest to be immediately declared illegal and kettled in under a week. Kettling is tactic during demonstrations that forces protesters into a small space, sectioning them off and leaving them with a single exit usually determined by police. The SPVM declared the demonstration illegal as a violation of municipal bylaw P-6 which states that groups must provide an itinerary. “Police partout, justice nulle part, [police everywhere, justice nowhere]” cried protesters. In squads, the SPVM surrounded Place Émilie-Gamelin. There were lines of cops blocking off Ste-Catherine St. and St-Hubert St. where police were quick to section off the small group that had gathered in commemoration and dissent. The protesters were defiant but there was a relaxed air to the scene. Volunteers were handing out sandwiches and a man played the snare-drum. It resembled a parade more than a protest if it weren’t for the brigades of police. The crowd marched up St-Hubert St. and turned east on De Maisonneuve Blvd.. As the protest neared St-Timothée St. police rushed in and forced them back. Before they could backtrack down a different path another line of police swept in and cut them off. Sandwiched between scores of flak jackets, batons, polycarbonate shields and jackboots, the bulk of demonstrators as well as journalists present were arrested and fined. Those not kettled were shooed and shoved away. The protest was quickly over with over 150 protesters detained and fined for being part of an illegal protest.